Homemade Crunchwrap for Daiya's Vegan Challenge! 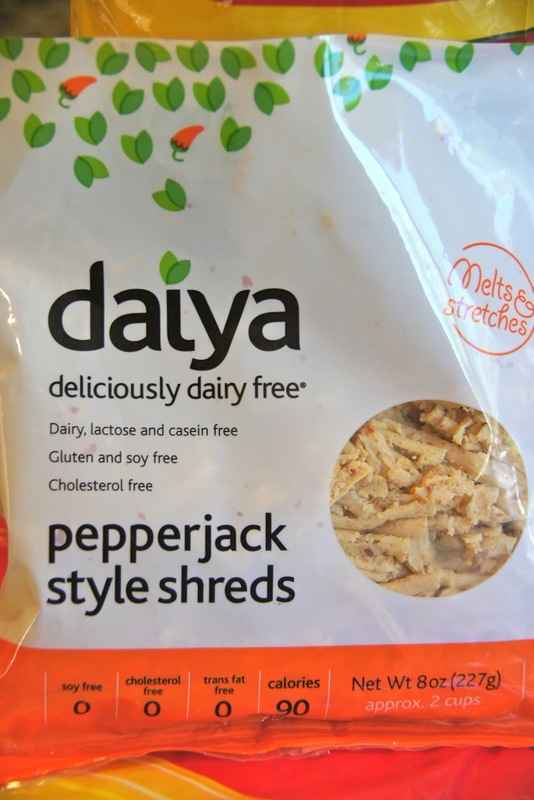 Daiya Foods has given us a cooking challenge. Daiya was kind enough to allow us to try their product and come up with a great recipe using one of their dairy-free cheeses! I jumped at the chance to try something new. I decided to make a Vegan Crunchwrap and it was AMAZING! It was so easy to make, and by chopping everything ahead of time, dinner took less than 10 minutes to make! We even enjoyed it again for lunch the next day because my 3 year old said it was her new favorite meal. We made it completely vegan and it was amazing! But the best part is that you can customize it to your own tastes. Heat a dry non-stick fry pan over medium high heat while you assemble the crunchwrap. Lay the tortilla flat and spread a layer of beans in the middle the diameter of the tostada crisp. Add hot sauce. Place the tortilla crisp on top of the beans. Layer the dairy-free sour cream on the tostada crisp. Top with the tomatoes, onion, Daiya shreds, and lettuce. Carefully begin making several folds into the flour tortilla in order to completely wrap the contents. If needed, take a piece of scrap tortilla and place it in the center to close any gap. Quickly place it topside down onto the fry pan. Allow to cook until it is golden and remains sealed. Flip and cook the other side until golden. This frittata is jam-packed with seasonal, fresh veggies! It would make a delicious breakfast for anyone, but I actually make it for my 1 year old. Frittatas are a great option for finger foods. They are quick to prepare, can be cut into pieces, and can be stored for up to three days in the fridge so it is ready when you need it. Frittata's were a staple for my oldest when she was eating finger foods and now my youngest is able to enjoy them too. You can customize them with any veggies and cheese you have on hand, but I always use seasonal produce. Only the freshest for my baby! :) I hope you try this recipe out for your kids or even yourself. It is delicious! In a small bowl, whisk the eggs together with the milk, basil, salt, and pepper. Heat the butter in a small oven-safe skillet over medium heat. Add the onion and cook until softened, about 3 minutes. Add the zucchini and tomatoes and cook for another 5 minutes. Remove the pan from the heat and add the eggs. Sprinkle the goat cheese on top. Place in the oven and cook for about 15 minutes, or until the egg is set and the edges start to pull away from the pan. Allow to cool. Flip the frittata out on to a cutting board and cut into pieces appropriate for your child's eating ability. Can be stored in an air tight container for up to three days in the refrigerator. Combine all the ingredients into a bowl and whisk until well combined. Cover and refrigerate for up to 7 days (not that it has EVER lasted that long in my fridge!). We try to steer clear of restaurants because you just never really know what is in the food they are serving. Is it loaded with extra salt and sugar? Is there a disgruntled employee in the kitchen? Most of the chains do not use organic produce (even the dirty dozen). But I do have to say that I love Red Robin! I grew up going to this restaurant and eating their chicken tenders with honey poppy seed dressing. Yum! As I got older, I started enjoying that flavor combination in salad form with their Crispy Chicken Tender Salad. However, since becoming a vegetarian many years ago, the days of getting that salad have ended. That is, until today! I am telling you, this salad is the best salad I have had in a very long time. The entire family loved it - even my 3 year old! Everything can be prepped ahead of time, except for the chicken, making this a very easy dinner. You could easily add real chicken if you wanted, but I was beyond thrilled with the Gardein. This recipe will be reappearing on our weekly menu frequently. It is just so delicious!! Bake the Gardein according to package directions. Allow to cool slightly and cut into thirds. Place the lettuce into a bowl. Top with the hardboiled egg, tomatoes, and cheese. Drizzle desired amount of dressing on top. I will also be making a Vegan Crunchwrap for this Friday's vegan challenge sponsored by Daiya Foods! We will be making a batch of kale chips for a snack and enjoying the watermelon and cantaloupe for dessert.